High levels of cover for the over 50s – now with a great new feature! You can choose to benefit from our exciting 3-year Fixed Price Promise. Great news! You can now select cover that includes our 3-year Price Promise, which means you’ll pay the same for the next two renewals if you choose to stay with us. So, as long as nothing changes on your policy, you’ll know exactly how much you’ll pay next year… and the year after. Don’t worry, this doesn’t mean you’re tied in for three years – we’ll send you your renewal documents after a year and whether or not you choose to stay with us is entirely up to you. 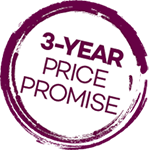 To find out more about our Price Promise and see how much you could pay for your next three years’ insurance, get a quote now. We also offer another level of cover, Essential Insurance, to see how our two cover levels compare click on our Home insurance cover options below. Please note: some of the above cover examples depend on whether you have a buildings or contents policy. If you need a higher level of cover, Saga TailorMade Home Insurance offers higher levels of buildings and worldwide contents cover and includes accidental damage cover as standard. Saga's range of insurance products is designed specifically for our customers and is unique to us. Our home insurance policies are provided by a number of insurers that all meet our high standards of quality and service. Our Trustpilot score is based solely on customer reviews and is a combined score for all our insurance products.